First, Angel Rangel gave the ball away for Javier Hernandez’s winner in Swansea’s 1-0 defeat to Manchester United. Then, John Obi Mikel was dispossessed by Charlie Adam for Liverpool’s opener in their 2-1 win at Chelsea. Finally, Benfica scored their second in the 2-2 Champions League draw at Old Trafford when David De Gea misplaced a pass. The three incidents were all different – in two of the cases it was an outfield player rather than the goalkeeper making the final pass – but they originated from the side trying to pass the ball out from the back. In these situations it’s easy to say that a player should have simply booted the ball downfield to get rid of the danger, but that saves a side from looking foolish, rather than necessarily saving them from conceding goals. In the Rangel example, Swansea may concede two or three goals a season from giving it away at the back, and these examples will be compiled and highlighted as an example of stupidity and negligence. But Swansea will save more goals than they lose through this strategy – by clearing the ball aimlessly downfield you won’t concede immediately, but you’re giving the ball away and probably handing the opposition another chance to build an attack. If they score from one of those, no-one will blame the initial clearance downfield. But what’s better in the long-term – to concede possession in a dangerous position less than once a game, or concede possession on the halfway line 25 times a game and invite 25 separate attacks from the opposition? Doing the former will invite more criticism, doing the latter will probably concede more goals. It’s a difficult thing to measure statistically, but since only one side in the Premier League (Manchester United) have more clean sheets than Swansea, it’s tough to argue that their approach at the back is fundamentally flawed. Of course, there are times when keeping the ball isn’t an option and a clearance is the safest bet. But when Rangel misplaced his pass last weekend, he wasn’t under that much pressure. If every Swansea defender cleared the ball when they were closed down that much, they’d never be able to build their passing moves, they’d be hoofing it non-stop and continually under pressure. The best way to defend is proactively, to defend without even defending. In other words, keeping possession of the ball. Spain are masters at this – for all their technical quality, at last year’s World Cup they were far better defensively than offensively. They scored a pitiful 1.17 goals per game, but conceded a superb 0.28 per game. They kept a clean sheet in each of the knockout matches. There’s quite a clear pattern there. Chelsea have the highest average percentage, and the best pass completion ratio. 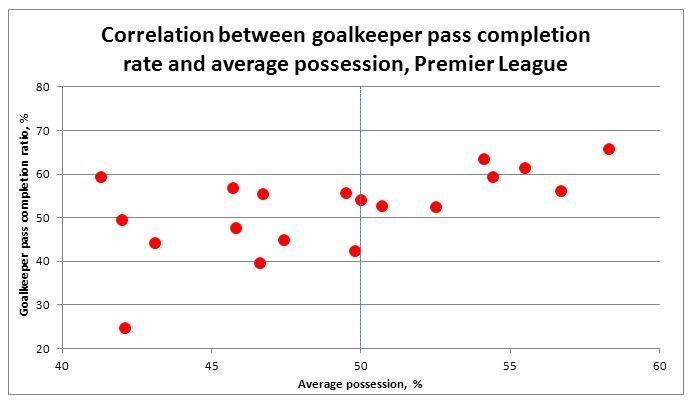 Looking at the graph more broadly, all of the sides who average more than 50% of possession (to the right of the vertical line) have a goalkeeper with a 50% or greater pass completion ratio. 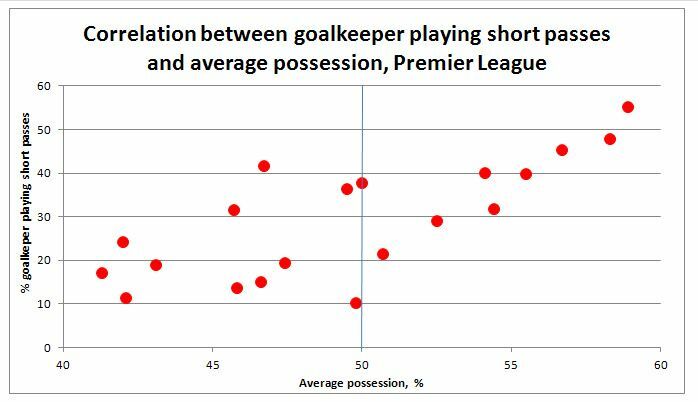 Therefore, a more accurate measure of passing is the proportion of a goalkeeper’s distribution that is short to a teammate rather than hoofed downfield, a figure recorded by Opta, expressed here in percentage terms. That brings Stoke more in line with the rest of the sides, and the correlation higher up the line are interesting too. The two anomalies here, incidentally, are Everton (more than 40% of goalkeeper distribution short, but a low possession count) and QPR (the highest percentage of long balls from their goalkeeper, but nearly 50% possession). None of this proves anything, or suggests much you wouldn’t expect, and we have to be careful in cause-effect terms. But if keeping the ball equals good defending, and if playing the first pass short to a teammate is linked to high possession, then goalkeepers and defences shouldn’t be too worried by the odd calamitous concession of a goal – in the long-term, they’ll benefit from their bravery. Valdes’ passing is a great throw-back to the passing of the Ajax sweepers of the mid-90s. Relatively long passing, in comparison to the rest of the team, out to the wings. He has been really solid with his out-balls to the wing this year. A not-insignificant amount of them are seemingly risky for a goalkeeper to even attempt, but he always ends up hitting Alves down the right or Adriano or Abidal down the left if the opponent has pressured Busquets and the centrebacks. HAHAHAHAHA Varfelona are a disgrace losing to a pi$$ poor team like Hetaff, they would be relegated in the EPL where talentless tika taka is exposed. Most overrated bunch of cheating divers of all time. Manuel Neuer is one of the best, if not the best, GK when it comes to ball distribution. True, his throws in particular are excellent. However, I feel that his passing is not quite at the same level, and nowhere near what Valdes displayed in the video above. Raises the interesting question: would van Gaal’s possession tactics have worked better with Neuer in goal? Goalkeeper distribution just has to be important in the modern game, but it’s great to see it explained with stats to back it up. As a Celtic fan I’m driven mad by seeing our goalie continually boot the ball up-field when we rarely have anyone(only Samaras but he isn’t a regular) who can win the ball but even then it’s still a very 50/50 strategy. Pretty stupid IMO. Agree on the 50:50 thing. Was watching a Stoke game earlier in the season and trying to work out how often they retained the ball when Crouch actually won it. Only seemed to work when they got two ahead of him. This is why (IMO) Ferguson went for De Gea ahead of the likes of Stekelenburg and Neuer – his distribution. It is excellent, he is quite Valdes-like in his accuracy hitting the full backs or wingers. One quick point. The goalkeeper kicking long % stats is before the most recent round of fixtures, just because i wrote this (and got stats) over the course of the week amongst other stuff. doubt figures have significantly changed. Robinson is actually very very accurate with his kicks, you watch Blackburn get a free kick from 10 yards inside their own half and he’ll drop the ball in a 1.5m radius in the opposition box damn near every time. Obviously the stats show that most of these are won by the defence, but you can’t knock Robinson (not that you have). I for one, think Paul Robinson should be held responsible for having, “… the worst pass completion rate of any player in Europe’s major five leagues,” as well the poor sucker who has to follow Big Sam (Megson, Steve Kean, even Coyle). The tactic to hoof it and press in the opposing half works (See the Women’s game the last two decades for its efficacy) , but Blackburn don’t seem to bother. They hoof it, lose the ball, retreat. I admit Robinson can hit some accurate long balls, but the tactic is so overused –like the legendary Delap Throw– that it is rendered ineffective because of its predictable qualities. half watching Blackburn / Stoke right now, and Robinson keeps whacking pointless long balls to Huth and Shawcross. Blackburn actually have some very decent footballers (N’zonzi, Hoilett, Formica) but they aren’t getting any opportunities to play football, just picking at scraps after Yakubu fails to win Robinson’s long kicks against 4 centre backs. Funny thing: Just as I read your post I turned on the Stoke/B’Burn game myself. The very first thing I see is Robinson hoof a ball forward under no pressure, Crouch winning the header on the half-way line, and Stoke going forward and scoring to make it 2-0. Excellent timing. Better ball retention from the back has changed the way teams press in Spain. Even top sides are very selective in when they attempt to put pressure on the goal keeper, often preferring to mark the midfield instead and let the defenders have the ball. In fact this was the general tactic in the Barcelona-Bilbao game shown in the video, despite Bielsa typically demanding a high press. 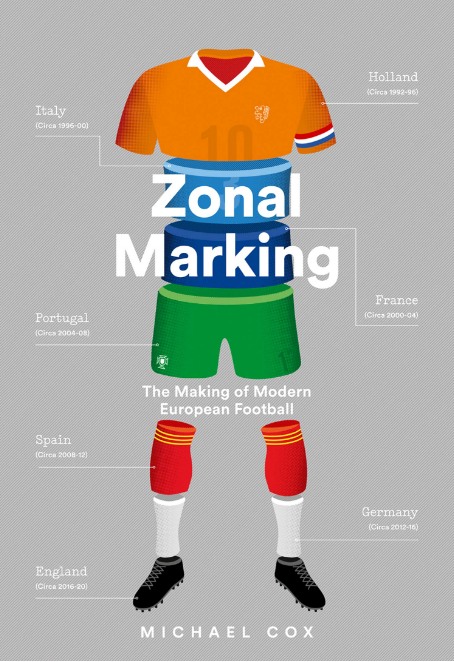 The pressing in that game was more ‘zonal’ than charging down players. If you are going to press the defence of top teams you can need to do so in numbers, practically marking man to man all over the pitch and losing the spare men at the back. In response we are now seeing goalkeepers start to kick long again to exploit a potential 3v3 up front from a quick targeted ball up to a striker. Your second plot looks like there’s two curves, perhaps each representing a different playing style with the goal keeper passing theory holding true in both cases. You also need good passing center backs – for years I’ve cried while watching my beloved US national team and the long ball tactics. Both Pique and Puyol combine excellently with Valdes and both are comfortable passing backwards when under pressure. Good point. Re: the USA. Klinsmann is seeking to play center backs who pass well. He’s been widely criticized for persisting with Michael Orozco-Fiscal, who occasionally seems a defensive liability. The Shin Guardian posted a good analysis of how the USA performs when he’s in the lineup: http://theshinguardian.com/2011/11/08/your-lying-eyes-what-klinsmann-recognizes-in-orozco-fiscal/. In short, the USA is a lot better at maintaining possession when Orozco-Fiscal plays, and scores more goals, even if he’s less likely to make the purely defensive plays other defenders would. For similar reasons, Klinsmann is bringing Tim Ream along. While his defending skills aren’t as good as other options, his passing is better. I suspect his ideal is to play both, as part of a shift away from a counterattacking strategy, in the pattern of tactical development ZM describes. How much easier must defending be with a’keeper like Valdes behind you?! Almost always gives you an extra passing option and most of the time it isn’t a negative ball. Defenders wont feel the need to punt it out as they’re confident in their ‘keepers ability. This is why Van der Sar was such a perfect keeper for United. They didn’t need an athletic shot stopping goalie that was going to pull off save after save because they are almost always going to be the dominant team in any given game. They just needed a keeper that was calm under pressure and tidy on the ball for the few times a game that he was called upon. De Gea is better passes than VanDer Sar and plays with Spain’s highly talented and successful U-21 NT. That is why they signed De Gea he is usually great with his feet. I’d say he’s the best GK in the PL in terms of passing from his feet. A skill which will only improve with age. Pepe Reina anyone? Overall the best keeper in the league, and also the best with his feet. How many mistakes like the one De Gea made on Wednesday have you ever seen Reina make? Have you seen Reina for Spain NT, and compare it with Valdez or Iker, Reina is not even in the same class in terms of passing ability and composure keeping ball at feet with strikers charging. Super GK though. What I really enjoyed here was the contrast between your interesting analysis, and the obscenely banal commentary in the video. So it’s nothing interesting what non-UK’ers are missing? Glad to hear that. There must be occasions when the goalie’s best use of the ball would be to flick a short pass to a defender who would head it back to him so that he now has the chance to catch it, and to kick or throw it as he judges best. It’s too easy for the attackers if they know that the goalie is restricted to kicking. When I am manager of Chelsea, I’ll have my boys (= elderly gents) practising this tactic. I’m not sure this is allowed, is it? Of course I’m allowed to be manager of Chelsea. No, what you explained is not allowed. All right, goalie to Terry, heads it to Alex, heads it to goalie. There you are. No matter if the four defenders touch the ball before heading it back to the keeper, it is still against the rule. The text is clear, it is the last header to the keeper, purposefully used to circumvent the law, that is illegal. Wait a moment, many times I’m seeing the situation that a defender, instead of clearing the ball away, uses his head to pass to his goalkeeper. How is that different from what he has described? What you’re talking about is the normal situation, which is allowed by the rules. The rule quoted by davk12 doesn’t apply to all headers to your team’s keeper, but only to those where a trick is deliberately used (by one of your team-mates) in order to be able to head the ball to your keeper instead of passing it to him. The illegal part is say your keeper throws the ball to defender who juggles it and heads it back to keeper, who wastes 7 seconds bouncing the ball, then throws it to defender who again juggles it and heads to keeper, repeated ad neaseum. Also there’s no good in building it out from the back if the players in possession aren’t capable – mikel (lacks moving the ball quickly when pressed) and otheres simply aren’t good enough passers of the ball and will lose it a fair bit in these situations. That said, Leon Britton is excellent on the ball. I’d say he has the best ball retention in england as a midfielder matched with wilshere and Mceachran. Surely one of the first midfielders on england’s team sheet, should he play for man united and not swansea. I think that too. It hurts watching Chelsea try to do it. They simply lack any kind of creativity. Excellent article once again. 10/10, This is a good example of the ‘global principles’ I had requested you to use more in your articles. Bravo ! As the first poster pointed out this goalie-as-sweeper thing goes back to Ajax – but much earlier than the 90s/van Gaal (with van der Sar in goal) side. Great article! Interesting figures, the second one in particular. Would perhaps be an idea to compare the correlation coefficients for the teams above/below the 50% posession mark? As you say, one shouldn’t assume causality because there is correlation, but one theory comes to mind; if the first pass (from the goalkeeper is short), then the second player on the ball (in that string of passes, starting with the goalkeeper) will be close to his own goal. That leaves this player to choose between playing it long or short. To keep posession, he is probably more likely to play it short (again) as he probably has more alternatives and movements to play on with higher security in a short pass than a long pass. This way, the ball will take more passes to get to the other goal, to put it as simply as possible, thus resulting in a higher posession rate. And we could assume that teams with players that aren’t able to keep the ball within the side this way promptly would be instructed to go route one. Also, in this way, perhaps the goalie’s pass acts the same way as the sweeper’s pass in the(counter-)attacking teams of eastern europe back in the 70’s, where the pace of that pass would dictate the speed and directness of the entire team for the following move. A posession-oriented game starts with the goalkeeper distribution? Great article mate. I think it’s interesting to see how football is evolving to the point where a player like Carroll could almost be considered redundant in in the modern age of football with the focus moving from a very direct style to one of a progressive build up through phases of passing. Obviously you can ony reallly build at from the back if you have the players who can do it. When I was at Sunderland and keane signed Gordon he Sadi he didn’t know how play from the back as he hadn’t be shown how to at hearts yet ward was more than happy (and a better keeper) as he had been shown this from ring at Forrest. This shows just how important it is that players have actually been brought up in this mentality so they are able to cope technically and tactically. It’s all cyclical. Look at how Real Madrid played Valencia — three DMs, with Khedira operating as a wrecking ball in their attacking half. The new possession emphasis — like baseball moving to valuing OBP over BA — will make counter attacking teams adopt similar tactics, choosing to disorient through the middle and build through quick passing out to the wings. Sort of a like closed game of chess, where central pawn structure is the DMs and bishop/rook play are the counter through the outlets. Let’s just hope 4-4-2 stays away forever, though. Evolution can leave that behind, please. I remember Arsène once deployed Diaby in the hole, very similar to Khedira’s role vs Valencia. Don’t recall the outcome though. As for the three DMs, yes Diarra is very Makélélé-like, but I see Xabi Alonso more as a regista. For some reason I believe Lampard will play deeper, as a regista, in the future. Maybe it’s the ‘cambio de orientación’ thing he has and Gerrard doesn’t. Lass is NOT Makélélé-like, he presses much higher, is worse at positioning and tackling and is generally worse at defending but he has great technique, is more creative and is more athletic than Makélélé was. Diaby played against Fenerbache I think a few years ago as the furthest forward midfielder and he scored. I didn’t notice him being a wrecking ball in the opposition half as much but used his skill and physical attributes in a more dangerous offensive position against the opposition. I have a recommendation for a game analysis next week. Right now Borussia Mönchengladbach to me is maybe the most suprising and tactically interesting side in atleast Germany, maybe even in Europe. So, I’d love to see you analyze their game and next week is the perfect opportunity as they’re facing Dortmund and their tremendous pressing. I’d be really happy to see you analyze that and I think it’s going to be really interesting. hey you ever thought of getting some job at ea sports or other virtual football games? Tell this to Mr Joseph Hart.His distribution is crap. It doesn’t matter because his teammates at MC are so good and at England so bad. This just reminds me of what I read about Robert Enke in Ronald Reng’s new book. Essentially, Enke was overlooked by Barcelona because he wasn’t confident enough in precisely this area: distributing the ball as a ’sweeper keeper’. Valdes was better than Enke with his feet and was given the gloves because of it. Where would Valdes be now if Enke was just that little bit more confident with his feet? Anyway, keep up the good work, Michael. I don`t know if it is a coincidence but Spanish goalkeepers seem to be the most comfortable with the ball at their feet and have the best distribution. My personal favourite is Pepe Reina. If he cannot play out to one of the CB`s, watch how accurately he pings the ball into a midfielder or a front man. In addition, he is the best sweeper-keeper that I have seen. When Benitez was manager of Liverpool he often commented on the fact that Liverpool were able to keep the defensive line higher thanks to the ability of Reina. Pepe Reina is the worst Spanish GK at this art, he is not at all comfortable on the ball in relation to Valdes, Iker, DeGea, I know ‘coz i watch and have watched them for 100’s upon 100’s of games. I do not mean to be rude Varun but if you think Reina`s distribution is poor, I would question your judgement. Maybe you would like to read following link http://fcbuzz.com/clubs/pepes-the-best-by-four-seconds – the author of this article would tend to agree with me. Actually of the 3 Spanish GK’s, Casillas is probably the worst when it comes to distribution from the back. I’d put Valdes only slightly better than Reina in the passing department but I have to say De Gea is quite excellent with the ball at his feet given his age. Great to see you publish this type of analyses, in addition to the regular single match analysis pieces! Omar Chaudhuri recently posted an excellent piece (http://5addedminutes.wordpress.com/2011/10/19/utilising-possession-in-the-premier-league/) on the relation between possession and performance in the EPL. It turns out that winning teams averaged 50.1% of possession in the past season, making the assumption that more possession equals better defending a precarious one. Cheers for the plug! I think Michael’s probably right that the best way to defend is with the ball, the problem is that a lot of teams, particularly in England, don’t have the technical ability to do this. Thus the decision to get men behind the ball and stay organised is often a better tactic for many. I remember being struck by Mourinho’s argument that possession also meant that you could rest a bit. This strikes me as being particularly pointless. The general gist of the article seems to be that if you have a goalkeeper who is comfortable on the ball, this will lead to better ball retention. Is it not truer to say if you have a great team with great players that you will have more of the ball and as a consequence of both those factors the pass completion percentages of your defensive players will all be higher as they are under less pressure from the opponent? Victor Valdes usually doesn’t have an opposition player within 30 meters of him while he casually plays the ball to his defenders. On the rare occasion a team presses him, he usually f*cks up. Valdes was akin to a David James figure before Guardiola took over Barca. Any goalie would have a chance at the Zamora on a team that averages 75% possession. Remove the points on the extreme right of the last graph (who averages over 55% possession? let me guess – Man City, Man Utd, Chelsea, Arsenal..?) and you have a graph of no correlation. This is the latest in a series of articles documenting something that is clear for anyone to see with statistics but showing no insight whatsoever. I bet the graph for left backs is almost exactly the same. I suspect you don’t really watch Barcelona and Valdes, but instead stick to an image of him, you have built up from different sources. No, he doesn’t f*ck up. In fact, in situation that most goalkeepers would simply clear the ball out, he keeps passing to the nearest player, be it either of CBs or a DM coming deep, looking for a pass to receive. If none is safe, he still has a perfectly trained pass to Alves or Maxwell. Not to mention Valdes’ great ability to get out of the goal and intercept a dangerous opposition pass. What more, Barcelona may perhaps allow less dangerous open game situations, but he manages to prevent his team from conceding a goal in many of “hopeless” situations, where it’s clear 100% chance for an opposition. He has also hardly made any blunders in recent years. except for the Valdes part, i’d agree with billy that the article, although well worked, is basically pointless… See when a team insists on passing their way out from the back, they are by definition taking a possession based strategy. So, it shouldn’t be any surprise that they’d end up with higher possession. Now how much is its effectiveness that is the real question. Do these teams with higher possession percentage also have better defensive records (clean sheets, shots conceded etc.) and if they do, then how much of it is down to the fact that these teams are indeed better teams overall? it’s interesting that so much talk is about swansea and blackburn.. I just checked that swansea actually has more shots conceded per game (17) than blackburn (15) despite their higher overall possession percentage (56% vs 43%).. I think that this possession stuff is over hyped. Possession percentage mean nothing in several football leagues. It is magical Barcelona team fancy people thinking triangle short passing is unearth stuff. Fact is that you still need player like Messi who can do something with ball. If goalkeeper and defender concede goal for more possession then I think there is something wrong with it. It better clear out if you doubt that it is safe. Which situation do you consider safe and which not? It’s up to player’s technical abilities. You said: “If goalkeeper and defender concede goal for more possession”. It’s not just for “more possession”. If you are going to give the ball away too cheaply, there was no point in starting short pass from the goal kick a few moments before. You could have simply cleared the ball away at the very beginning. So it’s not about “more possession”, but for “more consistency in your gameplan”/”keeping to your gameplan”. People make errors, if it happens sometimes, it’s none of a problem. It is always the case where you give ball away in my opinion. If you lose the ball near our goal area then you do more wrong. It is nice that team can slowly build up from back line but if you are not sure you better kick the ball out. Keeping the ball has unique advantages which work so well with Barcelona but is is not the prime rule. Defender may feel confident with dribble or passing however there is always possibility of lose the ball. Suppose it is only 5% possibility, Can we accept that probability? Yes if team cruise through easy game but No if it is so tight game. Suppose it is only 5% possibility, Can we accept that probability? I think this scrapes at the surface at the key dilemma that the article doesn’t really fully explore. In order to answer the question of whether or not it’s an acceptable probability, we would aslo need to look at the probability of conceding a goal after taking the “safer” alternative of kicking the ball long. For example, imagine a goal keeper has the ball 50 times in a game. Imagine the chance of messing up a short pass is 5%, as you suggest. And imagine that 70% of such turnovers result in a goal. Then you would expect to concede 50 x 5% x 70% = 1.75 goals per game if you solely followed the short-pass option. But to decide whether or not this is an acceptable risk, you would also have to compare it against the probability of conceding possesion from a long kick, and the probability of conceding a goal from such a turnover. If those probabilities are 40% and 5% respectively, then you would expect to concede 50 x 40% x 5% = 1 goal per game if you solely followed the long-kick option. Great point, although, as you said in your last sentence, there is much more to the case than a reductionist point of view. Short passing option adds to team’s creativity, also in the attack, etc. We can’t really measure the problem, but of course what you have stated is a good point to start from. Cheers! Agree with some of the last few comments.. Tell this article to a Bayern Munich fan last season and he will come to hit you.. the perfect example of the possession-centric Van Gaal demanding things from his team when they are not suited to it. Lahm has to go public to tell that the team has to ‘clear the ball’ more often in dangerous situations than try to ‘pass’ and f*ck up.. That is after they f*cked up so many times..
Sweeper keepers are nothing new and if your entire team can pass the ball as good as Barcelona, then it is only natural that the possession will be high.. But what is the probability ? Risk of the opposition scoring when you lose the ball near your box is more than losing it near their box.. You have at least the midfield and the defense to negotiate.. But here, once you lose it, there is no cover and you are exposed.. Again, it depends on the team and there is no use in having Crouch up front and not using his height..
A better thing to compare would be to take Swansea’s statistics on the number of goals they concede immediately after losing the ball near the box and the number of goals Blackburn concede after they lose the ball further back.. Thanks for this link.. it hits the nail on the head.. If you have a team that is so ruthless in front of the goal and you play against a team as naive as Arsenal, why would you need to keep the ball more ? Because you can play some good horizontal passes and bore the opposition ? Amazing that such sweeping statements are made just because Barcelona wins many games nowadays.. Would anyone have told this after the 2006 world cup ? Would it not have been absurd to suggest “The best way to attack is to counter and set pieces” after that Italy win? The thing that so many people forget is the team’s tactics depend on a lot of factors.. Just as Barcelona are drilled to pass the ball effectively, Italian and some of the previous German teams were drilled to defend better with discipline and organization.. So it is natural that they play that way and win.. 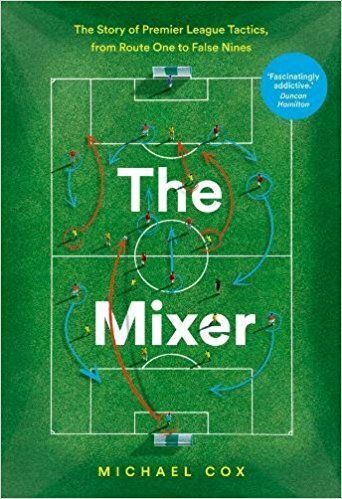 Calling one as THE WAY and the other as EASY WAY is arrogant and self righteous..
From Raphael’s article “In 2006, Spain took a decision: they weren’t physical and tough enough to outmuscle opponents, so instead wanted to concentrate on monopolising the ball”. So, basically Spain play that way because they have a handicap in certain other areas of the game and to overcome that, they chose this way.. which is what every good team should do.. Maximize your strength and minimize your weakness.. and this is not because they have given some commitment to the footballing Gods to play ‘beautiful football’.. This is a common excuse given in defense of the tiki-taka. Does that mean the so called ‘beautiful football’ does NOT work if the opponents are well organized ? If your system cannot break down the two lines of 4, which is the basic defensive system for decades, then what system are we talking about ? Something where the opponent HAS TO leave spaces in front of the defense so that you can merrily score ? I don’t think I would encourage such a system.. Will it work if you are a goal down with 5 minutes to go ? “They scored a pitiful 1.17 goals per game, but conceded a superb 0.28 per game” – which is exactly what the ‘defensive’ Italy conceded in 2006, but even they scored 11 goals in total.. Let’s not forget that Spain had a great deal of luck going on as well.. Had Kroos scored that easy chance or Robben scored in those one one ones, they may not be World champions at all..
Again, some statement to make without sufficient proof of how teams are really changing.. Do you mean that the top teams like Man Utd, Madrid, Munich etc have shown improved possession in recent years than before ? If you take out the pace and counter attacking capabilities of such teams, half of their weapons are negated..
IMO, Barcelona/Spain’s tactics are unique and it will fit only them.. This one size fits all approach will eventually be defeated and we already see some hints of that. It will be suicidal for other teams to simply copy them without the players capable of doing it.. A much better team will be one that is good in multiple situations with different types of players who are handy in different situations.. Physicality, Counter attacks, Organization etc are also part of football and lets not forget them just to encourage one particular team’s tactics.. In my opinion I do think that with the ball on your side all the time you not only have the option to build up more attacks/allow your team to get back in shape, you also deny the opposition the chances to attack/drag the opposition out of shape to win the ball back. Hence ZonalMarking’s “The best way to defend is proactively, to defend without even defending” statement is valid imo. That said, Arsenal lost Nasri and Fabregas and are now more direct with Walcott and Gervinho flanking Van Persie, and Ramsay marauding upwards to support in attack. They’re more exciting, quicker and more importantly, they’re winning games. So to a certain extent I agree that beautiful football in the middle of the park does not always guarantee winning results. Plus, there’s never a ’sure-win’ tactic. People will always come up with new ones to nullify the present ‘winning formula’. As we have seen thus far this season, Barcelona has been tinkering with various formation and various tactics because Guardiola knows that having one trick up his sleeve can only get him this far (3 successful seasons with each increasingly difficult as time goes by), so kudos for his willingness to try other things out. The question is ‘Are you successful now ?’ Can you beat Barcelona if you improve the build up play ? In the past 3 years where they have been very successful, the teams that have defeated them are not the ones which matched them for the passing or keeping the ball, but the ones that are organized and ruthless in front of the goal. So, if your earlier strength is pace down the wings and you are changing it now to a more build up play, are you maximizing your strength ? Do you have the players who are capable of retaining the ball ? These are the questions one need to answer before changing a team’s style of play. While they have tried different formations, the basic way of playing is still the same. So, the opposition does not care whether they play 4-3-3 or 3-4-3. All they do is put men behind the ball and be disciplined. Against Bilbao, after trying so long to break them down, the goal scored by Fabregas is a header from a cross by Abidal (not sure)from the flank.. you rarely see them doing this because they are so particular about the short passing stuff..
Marck, you can argue with a lot of things in this piece (and you have!) but I really don’t see how you can argue with the first statement you have quoted. It’s pretty much an irrefutable fact that the time when the opponent is least likely to score is the time when they don’t have the ball, do you not think? I agree.. but behind your statement “when the opponent is least likely to score is the time when they don’t have the ball” is the underlying assumption that all the teams need more time on the ball to score.. In the previous link, the example of Stoke city against Arsenal gave the perfect situation where Stoke only had 30% possession in the whole game and scored thrice whereas Arsenal could score only once with 70% possession. In other words, you are not actually defending against such teams by keeping the ball but playing right into their strengths, which is counter attacking and physicality. If you cannot break down defensively organized teams with all the possession, whats the use with it ? As many have said, its not the possession that counts, but what you do with it..
What if you let these teams have the ball for more time and nullify their strenghts ? Get them out of position by giving the ball to them rather than let them park the bus safely. I also think that Tiki-taka appears great because Barcelona has Messi in the team. You take out Messi and it is not so great anymore and they’ll not score so many goals.. which is what Spain faces now with out of form strikers and lack of width.. They can keep complaining that the other teams do not let them play football, but it doesn’t matter.. All their possession did not stop other teams from scoring.